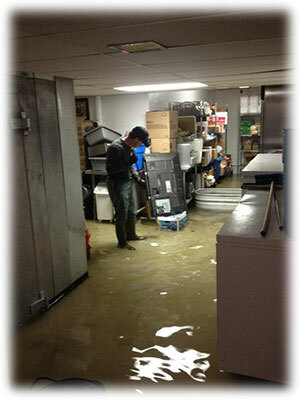 A flood is one of the most devastating events that a homeowner or business can experience. It’s far more than an inconvenience. Water causes a tremendous amount of damage. When not treated quickly, water will ruin carpets, walls, trim, cabinets, and nearly everything else. In a matter of hours your home or business will become a damp environment that’s perfect for the growth of mold, mildew and wood-destroying fungus. To make matters worse, many standard insurance policies don’t cover this type of damage. There have been many instances where this subsequent damage was so extensive that the house or building had to be demolished. With such a short time frame to act, widespread floods can be especially problematic as flood cleanup professionals are swamped with calls. The stakes are too high to wait days or weeks for a response. A timeframe of more than a few hours means risking extensive damage to your property. You need a company that can act fast. Northern Powerwashning is equipped to respond quickly in these emergency situations. We can help prevent further damage by pumping out all standing water in your property. Once the standing water is removed, we can assist in setting up dehumidifiers and dryers to remove the moisture trapped in carpets, walls and other porous surfaces. This second step is essential as failure to remove this moisture is the primary contributor to the growth of mold and mildew. We are also equipped to clean and disinfect concrete and non-porous surfaces in unfinished basements or similar spaces. In certain circumstances follow up with a professional mold remediation company may still be necessary. Do not delay, If you have standing water in your property, or just need some help cleaning up. Call Northern Power Washing immediately at (847) 321-8261.